Did you know we speak many languages at our office? In addition to English, we speak Thai, Laos, and Spanish as well. We have patients come from throughout Southern California looking for a dentist who speaks Thai and Laos. Dr Mani is one of the few Thai and Laos speaking dentists in Riverside County. Changes for denti-cal dentists in riverside ca . Elimination of 4 bitewing xrays on children under the age of 10. According to the new manual of criteria from denti-cal, 4 bitewing check up xrays on children under the age of 10 will no longer be covered. They will only allow 2 xrays. This is not good because it will make it more difficult to detect cavities on children under the age of 10. This change took effect June 1st 2014. Now your child will only be allowed 2 bitewing check up xrays when coming to get their teeth cleaned. It is a set back for children under the age of 10 years old. However, children can help prevent cavities but continuing to brush and floss regularly after every meal. If your child is over 10 years old they will still allow 4 bitewing checkup xrays. If you have questions about the denti-cal program for children in the Riverside CA area, you can call us at 951-687-8700. This article is more useful information for denti-cal dentists in Riverside CA but it can be useful information for denti-cal patients as well. Denti-cal is California’s verision of Medicaid. Often times if the patient has IEHP, molina, or medi-cal then they also have denti-cal. 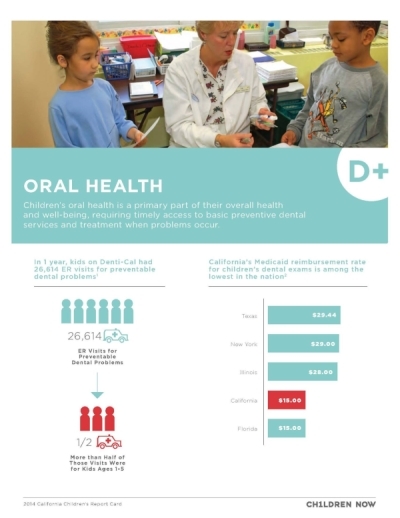 According to Childrennow.org, California is doing a poor job at helping children get oral health. Although the report card is from earlier this year, most of the article still applies to today. “By kindergarten, over 50% of children in California have already experienced dental decay and 28% have untreated decay. Children who reported having recent tooth pain were 4 times more likely to have a low grade point average.” What this points out obviously is it is important for your kids to get dental care as it may cause poor performance in school. “Thirteen rural counties do not have any dentists listed as a Medi-cal provider.” Luckily for us, Riverside County is not one of those counties. However there are still many kids in Riverside county who have not received dental care. Did you know that we have been providing emergency dental procedures for over 12 years to the Riverside, CA area? Maybe you have a real bad toothache? Maybe you chipped a front tooth? Got a broken denture? We can help you fix all these issues. Emergencies are generally seen immediately. If you call after hours you will hear a answering service. It is important to leave a message as it will page the doctor and or staff and they can get a hold of you. If you need a emergency dentist Riverside, CA give us a call at 951-687-8700. If you are looking for an emergency dentist Riverside, CA and it is after hours. Still give us a call at 951-687-8700 and leave a message to page the doctor and or staff. After hour visits generally will incur an extra fee to call the dentist and staff out to the office. The dentist lives in Riverside, CA and is available Saturday and Sundays for an additional fee. (photo courtesy of ADA american dental association). Happy 40th birthday Dr Mani! Blog updates, latest news and information about our office.